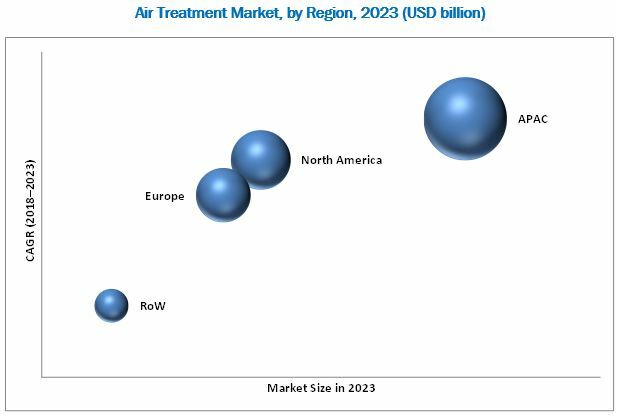 [142 Pages Report] The air treatment market is expected to reach USD 25.56 billion by 2023 from 16.11 billion in 2017, at a CAGR of 8.00% from 2018 to 2023. The growth of this market is propelled by the increasing demand from manufacturing, automobile, oil & gas, and power generation industries. 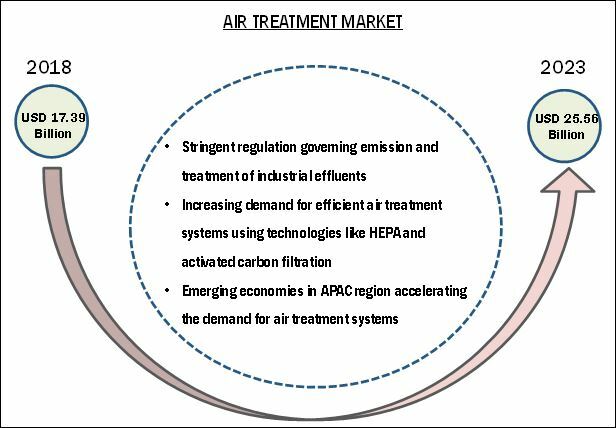 The growth of the air treatment market is majorly driven by increasing industrialization and urbanization, stringent regulations governing emissions and treatment of industrial effluents, and the need for achieving high efficiency with mechanical equipment and factory processes. Air treatment is done in various end-use verticals like manufacturing, automotive, oil & gas, power generation, pulp & paper, commercial, and residential. With the continuous development of technology and stringent emission regulations, there is a rise in the consumption efficient air treatment systems. HEPA filters and activated carbon are the dominant technologies leading the growth of the overall market. The base year considered for the study is 2017, and the market size forecast is provided for the period from 2018 to 2023. This research study involves an extensive use of secondary sources, such as companies’ annual reports/presentations, industry association publications, directories, Hoovers, Bloomberg BusinessWeek, Factiva, and OneSource to identify and collect information useful for this technical, market-oriented, and commercial study of the market. Bottom-up procedure has been employed to arrive at the size of the overall market from the revenue of the key players in the market. After arriving at the overall market size, the total market has been split into several segments and sub segments, which have been verified through primary research by conducting extensive interviews with key experts such as CEOs, VPs, directors, and executives. Data triangulation and market breakdown have been employed to complete the overall market engineering process and arrive at exact statistics for all segments and sub segments. The breakdown of the profiles of primary respondents is depicted in the below figure. The air treatment ecosystem suffers from the widespread availability of cheap grey market products. When will this scenario improve? How are industry players addressing this challenge? Market size for 2019 and 2021 for segments such as product, technology, application, and vertical, geography. Company information: detailed analysis and profiling of additional (5) market players. The air treatment market is expected to reach USD 25.56 billion by 2023 from USD 17.39 billion by 2018, at a CAGR of 8.00% during the forecast period. Factors driving the growth of the market include increasing industrialization and urbanization, stringent regulations governing emissions and treatment of industrial effluents, and the need for achieving high efficiency with mechanical equipment and factory processes. Based on technology, the air treatment market has been segmented into HEPA filters, electrostatic precipitators, activated carbon, UV filters, ionic filters, and conventional filters. HEPA filters are likely to account for the largest share of the market during the forecast period. The demand for HEPA filters is driven by growing concerns of environmental sustainability, regulations regarding industrial emissions, and health issues related to airborne diseases. The air treatment market for activated carbon is expected to grow at the highest CAGR amongst all technologies during the forecast period; this growth can be attributed to these filters being efficient in capturing all carbon containments, hazardous gases (sulfur dioxide, carbon monoxide, and others) chemical fumes, odors, and smoke. These filters are preferred in industries such as automotive, manufacturing, power generation, and oil & gas. Based on vertical, the air treatment market has been segmented into manufacturing, automotive, oil & gas, power generation, pulp & paper, commercial, and residential. The manufacturing industry is expected to hold the largest share of the market during the forecast period due to increasing industrialization and growing manufacturing activities in countries such as China, Japan, India, and South Korea. Tightening emission control regulations and air quality monitoring standards worldwide would be major drivers for the adoption of air treatment systems in the manufacturing industry. The automotive vertical is expected to be one of the significant contributors to the market in 2018 and the market for this segment is expected to grow at the highest CAGR amongst all verticals during the forecast period. APAC currently holds the largest share of the market and is expected to grow at the highest CAGR globally from 2018 to 2023. Countries in APAC such as China, Japan, India, and South Korea have some of the largest manufacturing facilities in the world. Increasing population, rapidly growing economies (developed as well as developing), and government initiatives to promote industrial growth have made APAC an ideal manufacturing destination for various sectors including semiconductors, electronics, and automotive. Advancements in terms of economic growth, infrastructural developments, and construction of power plants are expected to boost the growth of the market in APAC in the coming years. The major challenges for the companies in the air treatment market are increasing demand for electric vehicles and emerging alternative and renewable energy sources. Companies have adopted new product developments and partnerships, contracts, agreements, & joint-venture strategies, to expand their market presence and distribution networks in the air treatment market. Some of the major players in the air treatment market are Freudenberg Filtration Technologies (Freudenberg) (Germany), Donaldson Company Inc (Donaldson) (US), Parker Hannifin Corp. (Parker Hannifin) (US), Ahlstrom-Munksjö (Finland), Mann+Hummel (Germany), Cummins Inc. (US), Camfil Group (Sweden), and Atlas Copco AB (Sweden). The manufacturing segment includes metal & mining, food & beverages, machinery & equipment, chemicals, electrical & electronics industries. Industrial air treatment and filtration is gaining importance due to strict environmental regulations that are pushing for cleaner processes and technologies. The machinery & equipment manufacturing industry uses air filtration for adsorption of corrosive gases and dust and particulate matter. The chemicals industry uses air filtration for particle separation, catalyst support, pollution control, and for filtering a wide variety of fumes/smoke produced during chemicals manufacturing. The electrical & electronics industry uses air filtration for keeping particulates at lowest possible minimum levels and to maintain air quality inside manufacturing facilities. Air treatment in the automotive industry is an aspect of paramount importance. A slight deviation from prescribed air limits might cause corrosion and manufacturing errors. Temperature, humidity, and dust are the 3 very important factors that need to be controlled while manufacturing vehicles and other automotive components to ensure quality, longevity, and performance; air cleaners, air conditioners, and drying and heating devices are employed in the industry to achieve desired air quality; apart from these, emission exhaust filtration, and in-vehicle air quality are other important applications. Where will all these developments take the market in mid and long term? Which verticals will present major market potential in air treatment ecosystem? What will be the major market expansion strategy adopted by the players in the studied market?